Disclaimer: Allswell sent me the Luxe Hybrid for free for the purpose of this review. The thoughts below are my honest and complete opinion. 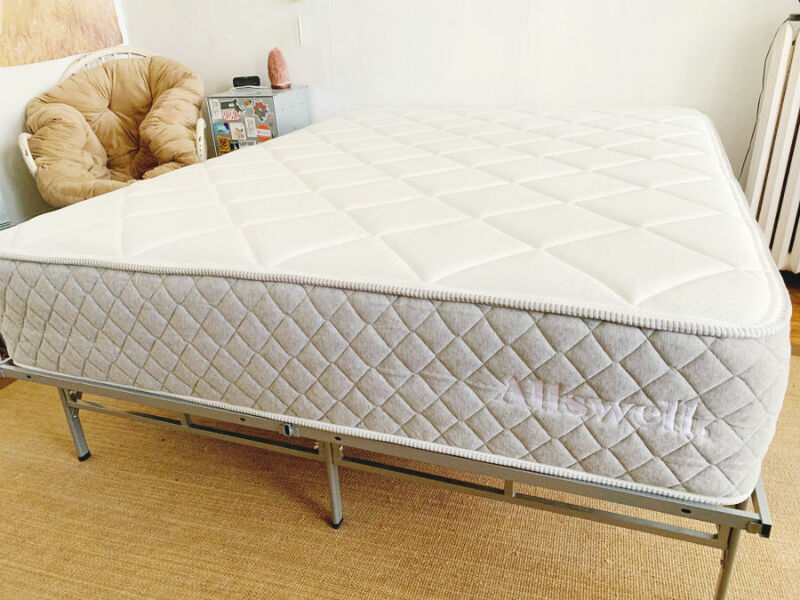 Allswell is a relative newcomer in the mattress world, but they have become increasingly popular with their promise of high-quality mattresses at an affordable price. 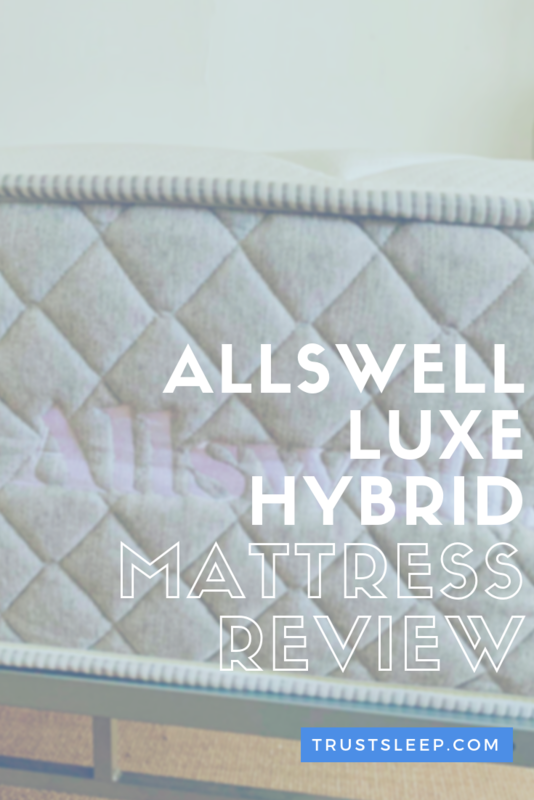 My partner and I have been sleeping on the Allswell Luxe Hybrid for the past couple weeks, and truthfully we have really enjoyed the support, cooling properties, and limited motion transfer that the mattress provides. Below we will outline the setup process, our thoughts, the comfort level, and more. If you’re running low on time, feel free to skip directly to my summary and rating. Let’s get started with the review. How Does The Allswell Luxe Hybrid Ship? Does The Mattress Have Any Off-Gassing? Do You Recommend Any Special Sheets Or Covers For The Mattress? I was amazed at just how easy it is to set up the Allswell Luxe Hybrid Mattress. You simply take the mattress out of the box, remove the plastic wrapping, and then watch the mattress magically inflate. It only takes a few seconds to expand, so make sure you set it up in a room where you have plenty of space. Like most mattresses that have been sealed and placed into a box, the mattresses continues to expand for up to three days after being initially unpacked. If possible, it is recommended that you let it fully expand before sleeping on it to maximize comfort. The Luxe Hybrid uses both springs and multiple layers of memory foam to capture the best of both of these materials. The spring system allows for premium support, durability, and ventilation. The memory foam top layers are extremely comfortable conforms to your body shape, and limit motion transfer. This means the mattress will last a long time, provide comfort, and not overheat, as many 100% memory foam mattresses tend to do. Using springs also keeps the price down manufacturing-wise, which allows Allswell to pass these savings on to you. Allswell wraps the entire mattress in a cooling fabric to further help regulate your temperature while you sleep, which is a great feature. I can’t stress enough how excellent the build quality is. 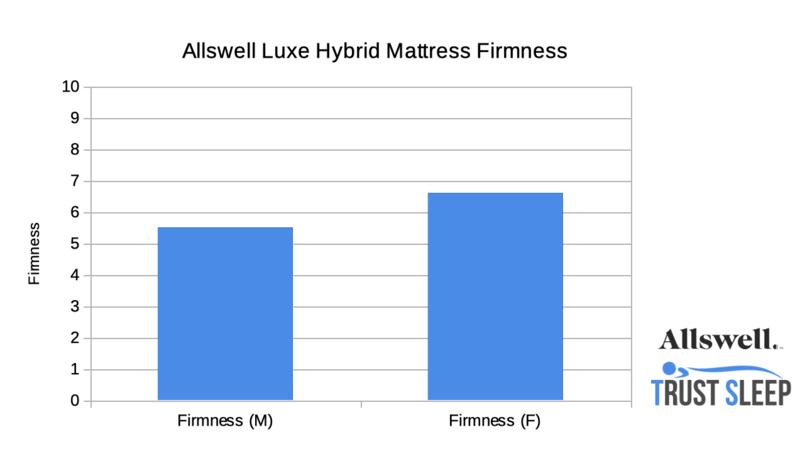 When it comes to firmness levels, I gave the Allswell Luxe Hybrid a 5.5 rating, while my partner gave it a 6.7. I would place this in the medium category, while she places it in the medium-firm category. This makes sense, considering that she is significantly smaller than me. This makes sense – mattresses tend to feel softer for heavier people since they sink into the mattress more. Meanwhile, smaller people tend to just barely sink into the top layer of the mattress, thus it feels firmer. However, the most important thing is that we both found the mattress to be comfortable while sleeping on our side, back, and stomach. 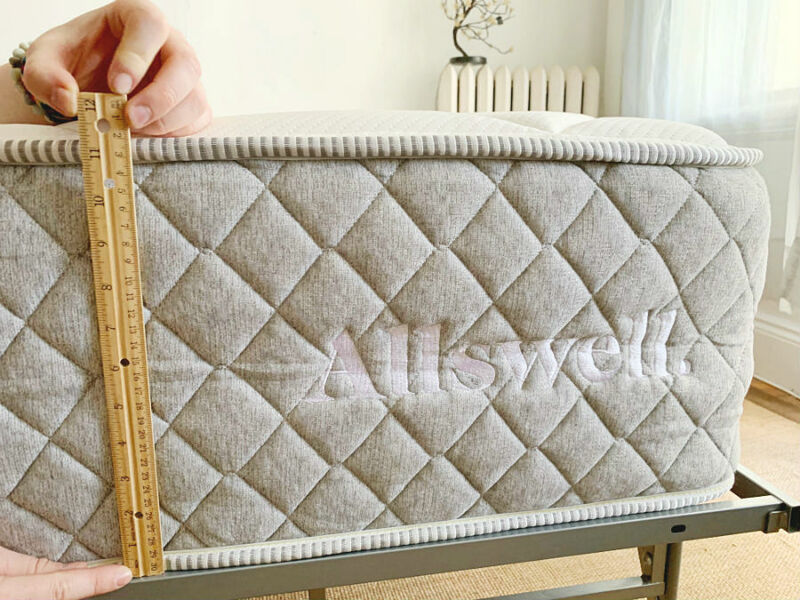 Most mattresses tend to soften as they age, and I imagine this one will be no different, so it should slide down on the firmness chart slightly as we use it more. It’s important to note that there is a difference, in my opinion, between being supporting and being soft. The overall mattress is not soft in the way that a 100% memory foam mattress is, but it is comfortable and provides support. When I wake up in the morning I do not experience any pain, which is a great change – before I was sleeping on a soft mattress that left my pressure points aching each morning. These pains are now completely gone. This is a true 12-inch mattress, which really makes it feel substantial. Previously my partner and I were sleeping on a 7.5-inch memory foam mattress, and the difference was truly shocking. The Allswell Luxe Hybrid has a tremendous amount of depth, and this helps limit motion transfer. This is great for couples – previously, I would wake up whenever my partner changed position or got up in the middle of the night. Because the mattress handles motion transfer so well, I barely feel movement from her side of the bed, which is fantastic. It is not completely free of motion transfer, but it does an extremely great job of it, especially considering the price point. The price of the Allswell Luxe Hybrids is one of its biggest head-turners. These are incredibly great prices for high-quality mattresses. You would be hard-pressed to find other mattresses of this quality at a lower price, especially ones that are CertiPUR-US certified like the Luxe Hybrid. It’s important to note that these prices blow retail mattress shops out of the water, and they are also quite competitive for mattress-in-a-box companies as well. Allswell is owned by Walmart, which is known for its conscious effort to create affordable products and passing the savings onto the customer, so this makes sense. It’s important to note that the Allswell Luxe Hybrid comes with a ton of great features, including a 100-Night Risk-Free Trial, a 10-Year Warranty, and Free Ground Shipping. These are all fantastic and means that you can give the mattress a three-month test run, and know that you can easily return it in case it’s not right for you. It’s important to keep in mind that it takes some time for your body to adjust to a new mattress, and it takes time for a new mattress to soften up. Give it a few weeks to see if this will be the right mattress for you. The Allswell Luxe Hybrid ships in a box right to your front door. It’s incredibly convenient, but keep in mind that it is heavier than it looks! Being moderately strong I was able to lift the box into our bedroom, but I highly recommend asking a friend or your partner to help you with the box. It will make things much easier. Once you get the box to your desired location it is easy for one person to open up. Like any mattress that is shipped in a box, the Allswell Luxe Hybrid does have some initial off-gassing. However, it is mild and comparable to other mattresses on the market today. We let the mattress air out for a few hours with the windows open, and after that, the off-gassing dissipated. Yes, I recommend purchasing some of the of Allswell branded products along with the mattress such as A Premium Mattress Cover, All-Season Duvet Insert, Percale Sheet Set, and more. If you already have these items they should work just fine with the Allswell mattress since they are available in standard sizes, but it is nice to know that you can get everything you need, shipped right to your door. The Allswell Luxe Hybrid is a luxurious mattress available at an affordable price. We highly recommend it, especially if you are a fan of firmer mattresses. It is made of high-quality materials that are CertiPUR-US certified, comes with a fantastic 100-Night Risk-Free Trial, and provides a fantastic level of support. Keep in mind it is definitely on the medium-firmer side, which is great for stomach sleepers, although back sleepers will enjoy it as well. ← What Kind Of Tea Helps You Sleep?